Sideswipe Accidents | Nashville Car Injury Lawyers The Law Offices of John Day, P.C. Sideswipe accidents happen when two vehicles are driving next to one another in the same direction and the sides of the two vehicles contact one another. Sideswipe accidents often happen when one driver makes a lane change without first looking to make sure there is no car already in the other lane. Other times, a driver may carelessly drift into another lane because the driver is not paying enough attention, whether the driver is texting, playing with an iPod, talking on the phone or with a passenger, or just too fatigued or intoxicated to be behind the wheel at all. Many sideswipe collisions occur where two lanes merge, such as Interstate on ramps. If a driver does not make sure there is enough space to safely merge, or if another driver quickly changes speeds and takes away that space, an accident is likely to happen. 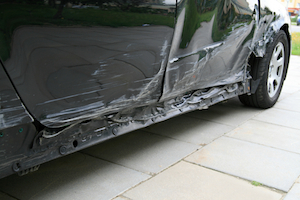 Injuries in sideswipe collisions can be severe. Cars are generally designed to give the most protection against head-on and rear-end collisions. For example, the front and rear of a car have bumpers to absorb the force of an impact. But in a sideswipe accident, there is little space between the side of the car where the impact occurs and the passengers inside. In addition, sideswipe accidents often lead a second collision another vehicle, a guardrail, a concrete barrier, trees, light posts, or signs along the road. Under Tennessee law, every driver is supposed to keep a lookout and be aware of all nearby vehicles, and to do their best to avoid a collision. Tennessee law requires a driver to keep his or her vehicle in one lane as much as possible. Under Tennessee Code Annotated sec. 55-8-123, it is illegal for a driver to cross or merge into another lane before the driver has first checked and verified it is safe to move into that lane. Our lawyers have successfully represented victims of sideswipe collisions throughout Tennessee. We have successfully pursued claims against trucking companies, tour bus companies, and car drivers. We have handled sideswipe cases on Interstates, rural highways and on city streets. Contact us online or call us anytime at 615-742-4880 or toll-free at 866.812.8787. One of our experienced accident attorneys will provide you with a free evaluation to discuss a potential sideswipe claim. As always, we never get paid unless we win. And, we advance all case expenses so you are not out of pocket any money to pursue your sideswipe collision claim. We have recovered more than $100 million for our satisfied clients and we would like to help you too.